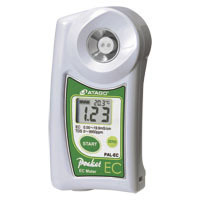 EC Meter | ATAGO CO.,LTD. The PAL Series now has an EC Meter! The Pocket EC Meter PAL-EC is capable of measurements with just 0.6mL of sample.The unit also features dual scales of electrical conductivity (mS/cm) and TDS (Total Dissolved Solids) (ppm). The PAL-EC is ideal for use in a wide variety of fields such as Agriculture (soil and hydroponics) or Industrial (waste water or cleaning solutions). *Calibrate with the Standard solution (12.9mS/cm). 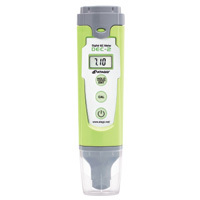 Introducing the DEC-2, ATAGO's new low Priced Electric Conductivity Meter. 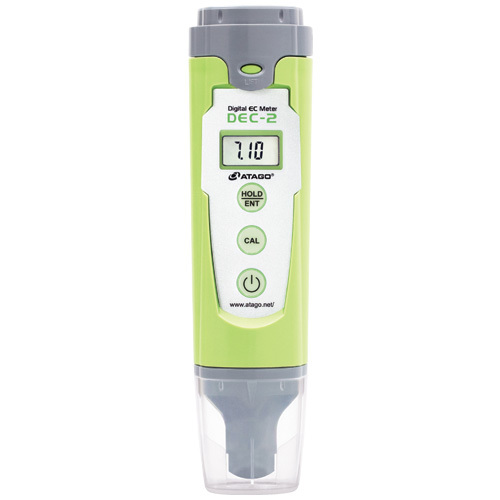 The compact, easy to use design makes the DEC-2 the ideal instrument to take anywhere you need to measure conductivity. The unit is water resistant (IP67). The DEC-2 also features Automatic Temperature Compensation from 0 to 50°C. For soil and hydroponics, industrial washing liquids, checking wastewater and other soluble solutions the DEC-2 is an easy and accurate, not to mention inexpensive, way to measure conductivity. *Calibrate with the Sodium Chloride(0.71g/100g).